Karting, also known as go-karting or kart racing, is quite an elaborate sport. Just like with auto races, there are many types of karts out there for different purposes. Since the activity can range anywhere from amusement park family fun to world-class professional karting championships, karts vary considerably based on the materials they are made of, their chassis, tires, engine types, and most importantly, their capabilities and top speeds. Whereas karts found in amusement parks and other recreational facilities intended for amateur use usually don’t go faster than around 15 mph, on the higher end of the spectrum, there are professional racing karts known as Superkarts that can go up to 155 mph. 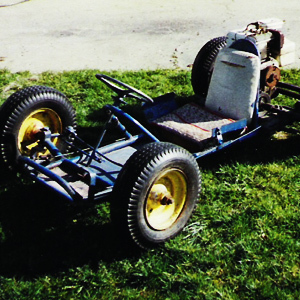 In the case of most karts, the chassis is built out of steel tubes, but karts vary according to whether they have a roll cage included to protect the driver in case of an accident. Chassis designs also differ in terms of where the driver sits. Open karts, as the name suggests, lack a roll cage, while caged karts (used primarily for racing on dirt tracks) have this added driver protection. For sprint kart races, straight chassis karts are used, in which the driver sits in the middle, whereas in speedway races where drivers take left turns only, the offset chassis is used (the driver sits on the left side). In terms of engine types and capacity, there are traditional gasoline-based karts as well as electric karts. In the former case, 2-stroke engines and 4-stroke engines are both quite common: the 2-stroke engine is used more often in professional kart races; the 4-stroke engine is applied more frequently in recreational karts. Modern, zero-emissions electric karts are particularly useful for indoor race tracks since they don’t emit any harmful substances, can easily be recharged, and are able to run uninterrupted for about 20 minutes on a full charge.